Toast quinoa in a medium saucepan over medium-high heat, swirling pan occasionally, until fragrant, 3 to 5 minutes. Rinse quinoa in a fine-mesh sieve under cool water; return to saucepan, add broth and bring to a boil over high heat. Cover, reduce heat to low and simmer until liquid is absorbed, 15 to 20 minutes. Spread quinoa on a rimmed baking sheet to cool. Heat 4 teaspoons oil in a large skillet over medium-high heat. Add garlic and ginger and cook, stirring constantly, until fragrant but not browned, 30 seconds to 1 minute. Add vegetables and cook, stirring constantly, until tender, 3 to 5 minutes. Add soy sauce, pepper and quinoa and cook, stirring often, until heated through, about 2 minutes. Brush remaining oil in a large nonstick skillet and place over medium-high heat. Crack eggs into skillet and cook 3 to 4 minutes for sunny-side up; for over easy, flip and cook until the white is set, 1 to 2 minutes more. 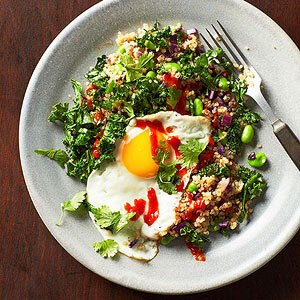 Divide quinoa among four plates, top each serving with an egg, and garnish with sriracha and cilantro if desired. PER SERVING: 365 cal., 16 g total fat (3 g sat. fat), 781 mg sodium, 39 g carb. (6 g fiber), 18 g pro.